FishWare Lodging and GuideServices features 8 calendars plus Guide/Staff 6 week calendars. The main calendars are Lodging, Housekeeping, Meals, Guides/Contractors, Monthly Reservations, Fishing/Venue, Employee and Staff/Category Calendars. Standard reports are available for the appropriate categories. FishWare Lodging and GuideService pricing includes the FishWare Host and up to 2 FishWare Clients . 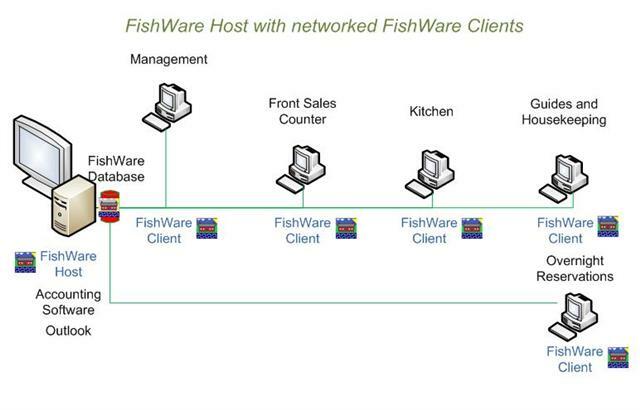 Additional FishWare Client - FishWare Clients connect to the FishWare database across an ethernet network and can display the same main FishWare Calendars as the FishWare Host. 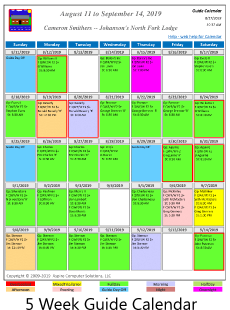 To speed processing, clients only display the Lodging Calendar by default. FishWare is a database application built to run on Microsoft client operating systems using Microsoft technologies. A Server operating system is not required. Windows XP, Windows Vista and Windows 7 are supported. Testing is in progress on Windows 8.1. Both the FishWare Host and FishWare Client applications require a computer with sufficient processor and memory capability. For the Host computer FishWare recommends Intel Dual Core or Quad Core (preferred) processors with a minimum of 2G of memory. The FishWare client computers must load the FishWare data from across the network, it is recommended that Intel Dual Core with 2G of memory be the minimum processor/memory for a client. Aspire can provide on site delivery, installation and training if you prefer. You would need to cover travel, meal and lodging expenses.